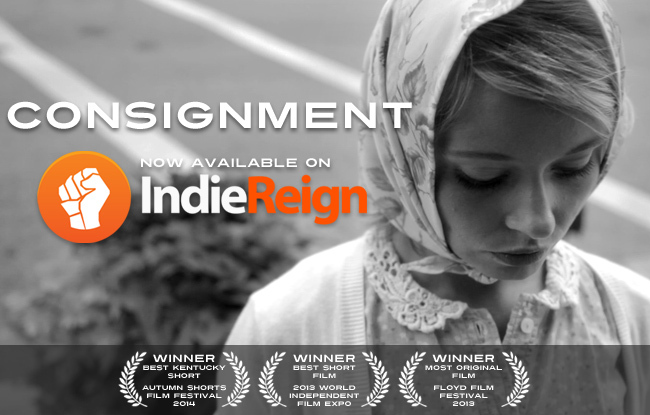 Justin Hannah's "Consignment" now showing on IndieReign! Film auteur Alfred Hitchcock was a key inspiration for "Consignment," an atmospheric mystery which arrived this week on the popular global movie platform IndieReign (watch it here). The award-winning "Consignment" is set in 1954 (the same year Hitchcock's Rear Window was released), and in terms of style, would not seem out of place among dark thrillers like The Wrong Man, Rear Window and the masterpiece Vertigo. "Consignment" isn't your typical period piece. Rather than attempting to recreate the world of the 1950's, it recreates the film-world of the 1950's - an alternate, exaggerated black and white reality full of mystery, beauty and suspense. The films of Alfred Hitchcock are a particular touchstone for this alternate world. Speaking with the movie website Popcorn and Vodka, the film's director, Justin Hannah, explained the aesthetic and how it led to the creation of the film. "It started with my interest in a sort of 1950’s style of filmmaking – these exaggerated, stylized films with very dramatic lighting, lush narrative music and mannered performances. I love the feeling of mood of those kinds of films. So I wanted to make something in that style, in that alternate world." In "Consignment," a desperate young woman must make a choice between a life of loneliness, and a curse of hollow love. Critics have praised the stylish film noir as "an alluring, multi-layered film experience" (Ruth Burgess, KyForward.com) and "a visual masterpiece" (Mark Vanderpool, Port Cities Review). In his review of the film, Richard Propes of The Independent Critic said that "this level of complexity is seldom found within the confines of a short film... a beautifully realized and thought provoking short film." During its festival run, "Consignment" won awards for Best Kentucky Short at the 2014 Autumn Shorts Film Festival, Best Short Film at the 2013 World Independent Film Expo, and Most Original Film at the 2013 Floyd Film Festival. "Consignment" currently has a score of 8.8 on IMDB. IndieReign is a worldwide film marketplace, with offices in New Zealand, the United States and India. The global VOD platform offers audiences the opportunity to discover new, rewarding content from around the world, and gives filmmakers the ability to market and monetize their films. IndieReign has been featured on IMDb, Yahoo, Mashable and Indiewire. "Consignment" is also available via Hulu and Hulu Plus, Amazon Instant Video, Vimeo On Demand and IndieFlix.